Missouri Senator Claire McCaskill, co-chair of the Obama campaign, was reached by phone on her way to cast her vote in Kirkwood, a St. Louis suburb. She said she had been on the phone all morning collecting reports of huge turnout in Democratic and Republican precincts alike. Reports of the heaviest voting, she said, came from urban areas, and "that's great news for me." In Missouri, Obama's path to victory hinges on his ability to boost his margins in the urban centers to 10% above levels in recent presidential election years, McCaskill said, while holding Republican margins to traditional levels outside the cities. "I feel pretty comfortable with saying we're going to have one for the record books," McCaskill said. She reported a conversation with staff at one St. Louis-area precinct where 650 people voted in the first hour. "And that's jaw-dropping," she said. It's a hard state for Obama to win, she added. But he has the enthusiasm factor on his side. "You don't have the sense that people are rushing out to vote for John McCain. It's more of an anti-Obama vote than a pro-McCain vote." Regardless of their reasons, Republicans are also pouring into the polls in Missouri. GOP leaders reported heavy turnouts and said their carefully targeted late efforts were inspiring likely McCain voters. While Obama blanketed Missouri, they said, McCain employed a laser. The Sun Comes Out for  Obama? Along The Paseo, Kansas City's storied urban corridor, a 62-year-old man with a bent back made his way down the sidewalk with the help of a walnut cane. He was carrying a heavy metal folding chair, which had helped him through his two-hour wait to vote at St. James United Methodist Church, one of the city's largest "Freedom Ward" polling places. He wore a kufi of African mudcloth design and a watch chain dangled from his trouser pocket. He had a hike of a mile and a half still ahead of him. "People walk further than that to vote in other countries  Americans are too soft," said Harry E. Brown. On the other hand, "the only reason I'd walk this far," he added, was for Barack Obama. "It's not because of the color of his skin  it's because of the change he will bring to America and bailing us out of this mess." Brown said he lived in Jackson, Miss., in the 1950s and '60s. ""So I know what prejudice is. I rode in buses when the blacks had to stand in the back. I drank at water fountains that said 'Coloreds.' You couldn't eat at the restaurants. You had to get your meals in a brown paper sack at the back door." An African-American in the White House "is long overdue," Brown said, "and I just pray that America is willing to accept it and not eliminate it." But other black voters here found the theme of racial milestones too simplistic. At the church, where a long line wrapped around the large building, a white reporter was met with exasperated murmurs when she asked how it felt finally to have an African-American on the ballot. "He's bi-racial. I don't know why you all keep saying that. He's for all the people, and all the eyes of the world are on us today," said Sharon Weathers, 40, an unemployed mental health worker. See the next President's to-do list. A Democratic Advantage in Florida's I-4 Corridor? In electoral-vote rich Florida, ground zero is the unpredictable Interstate-4 corridor which stretches across the state's mid-section from Daytona Beach on the east coast through Walt Disney World to Tampa Bay in the west. Along this swath, Tampa Bay is known as the state's bellwether: since 1980, as Tampa Bay votes, so has the state, according to political analyst Susan MacManus, distinguished professor at University of South Florida. 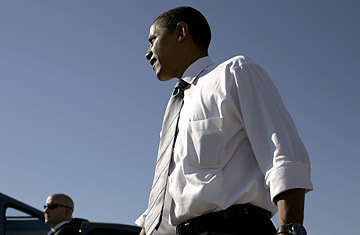 Final polls showed Obama and McCain tied in Tampa Bay at 46-46 coming into today's election. The more Republican-leaning eastern end of the corridor gives McCain a slight edge. But signs of Democratic momentum in the Sunshine State's mid-section are appearing. In Orange County, home of Orlando, 40,000 more Democrats were registered since 2004, while Republican registration remained flat, giving Democrats a 67,000-voter edge, according to political analyst Aubrey Jewett of the University of Central Florida.